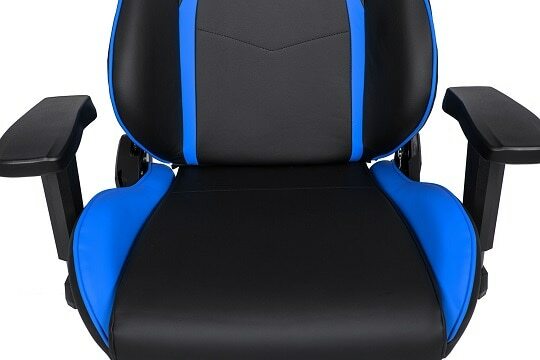 Are you in the market for a new gaming chair? You’ve probably noticed how difficult it is to separate the real, high-quality products from the rest, right? Well, we’re here to help: today, we’ll be taking a look at the new AKRacing Nitro to see if it fits your needs, and more importantly, your budget. Straight away, it’s clear that there’s a lot to like. 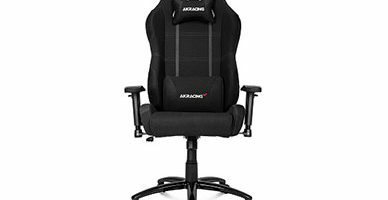 Like most gaming chairs, the Nitro boasts a racing-car style bucket seat designed to redistribute your weight evenly. What does this mean? Well, you’ll notice that it’s a lot more comfortable during extended sessions than say, a low-backed office chair. Although there isn’t any breathable fabric here, the chair tries to remain as open as possible to prevent excessive sweating. Notice the two cut-outs in the back and how the backrest tapers inwards at the bottom? If your room has decent ventilation, this allows the cold air to reach you, despite the large size of the chair. 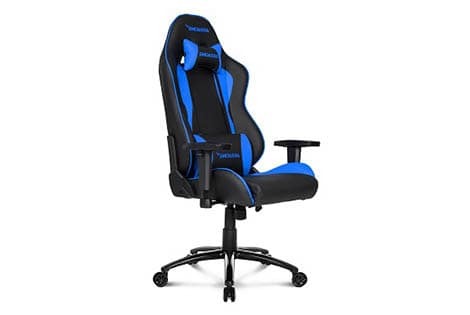 We were also pleased to see a sturdy metal frame: this isn’t the cheapest chair on the market, and as such, you’ll want to be sure it’ll last for years. There’s a class four gas lift supporting up to 330lbs, as well as a five-spoke, solidly-built base. Some people complain about PU leather chairs, claiming they’re not as comfortable as fabric-upholstered models. However, when we talk about comfort, it all comes down to the foam padding inside. The AKRacing Nitro features high-density foam that’s not only resilient to compression but as comfortable as it’s possible to be. 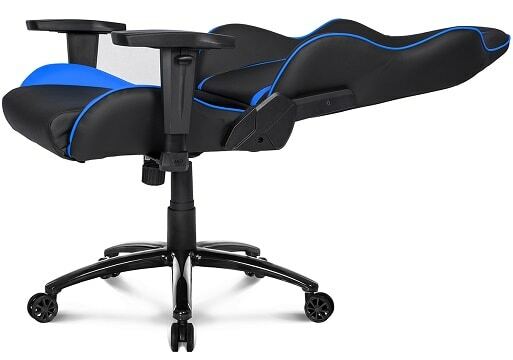 This chair comes with two fully-adjustable (and removable) lumbar support and headrest cushions. Yes, these help keep you comfy, but they actually serve a larger purpose: preventing back and neck strain after long periods of sitting. If your job involves working at a desk, you may have noticed you’re sore after work; the Nitro is specifically designed to help alleviate these problems. 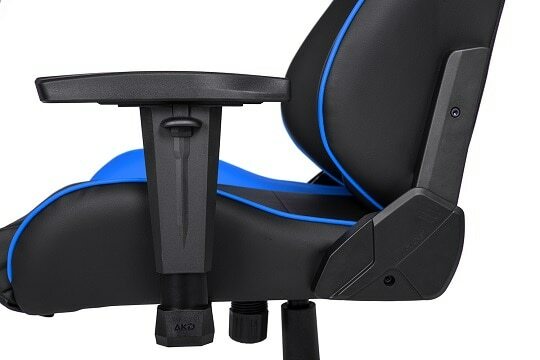 If you’re the kind of person that likes to kick back at your desk, the AKRacing Nitro is perfect. 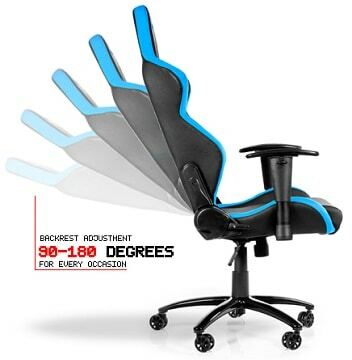 You can recline almost 180° without any kind of instability, plus you can rock up to 12° backward. There is, of course, a tilt locker in case you’d rather not, though. We know what you’re thinking: it’s a big chair, so it’s going to be a pain to move around, right? Well, it’s actually not: weighing just 22kg (48lbs), it’s light enough to scoot around on and far less cumbersome than its frame suggests. It’s easy to create bad armrests, but much harder to make ones that are not just good, but extremely functional. Surprise! AKRacing has managed to do just that! 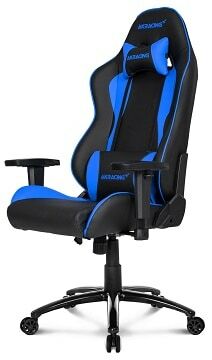 The Nitro features 2D armrests that can be moved in, out, up, and down to fit your requirements exactly. Better yet, they can be moved independently of one another. There’s a good amount of customizability here. You can change the height of the seat by up to 8cm (3”), and with six color schemes to choose from, there’s almost certainly one to match your existing décor. We particularly liked the black and white version – it says “relaxed, but always professional”. The Nitro itself is easy enough to build. It comes in just a few distinct parts, and like most other products on the market, is held together by a series of Allen screws. The total construction time should be ten minutes or so, and you don’t even need a friend to help out, which is great. 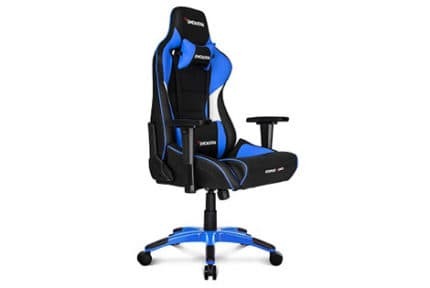 This product retails for around €310 ($358, £278), placing it firmly in the mid-budget gaming chair price range. There’s an awful lot of competition in this price bracket, but often, you’ll find that products add features you don’t need or want, like fully-customizable back frames or massive functionality. 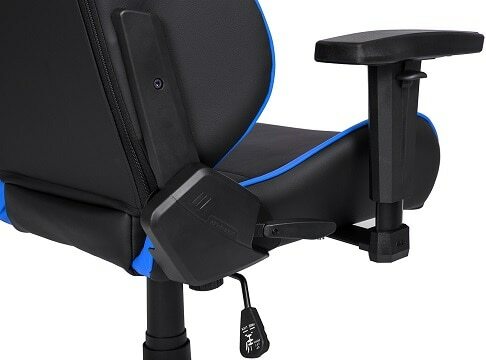 In contrast, the Nitro offers all of the core features (ergonomic design, adjustable armrests) while remaining affordable by eschewing the more advanced, less-desired ones. Plus, AKRacing has an option most other companies don’t: eSports sponsorships. If you’re at the top of your game, you may be able to obtain a Nitro for free! Now, because AKRacing is based in Sweden and uses a courier company, you might find that delivery is pretty expensive outside of Europe. On the plus side, though, the company aims to deliver your chair within a week, regardless of where you’re located. That’s not half bad, particularly as it’s a fairly large package. 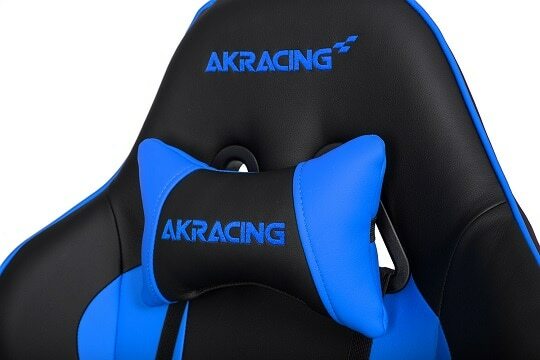 All AKRacing gaming chairs include a 14-day returns policy, shipment tracking details, and a two-year warranty covering manufacturing defects. Most of its rivals only cover their products for one year, so we’re already off to a good start. What if you run into a problem after purchase, though? Well, in this case, you can contact AKRacing for support via the customer help form, email, or social media. You shouldn’t have to use these methods, however, as detailed assembly guides and FAQs are available on the site’s support page. Really, any of the information you’ll ever need is detailed in the guide. We feel it’s worth mentioning that you can pay with major credit cards, PayPal, or even a bank transfer. Often, you’ll find that only a handful of payment options are provided, and PayPal in particular, really makes the purchasing process easy. 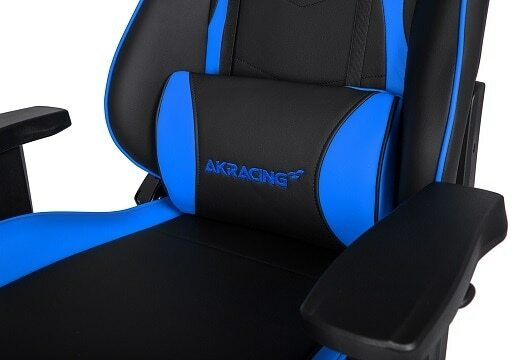 The AKRacing Nitro is a solidly-built, attractive gaming chair with a good price point and above-average functionality. 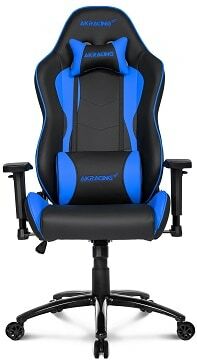 If you need a reliable chair with an ergonomic design, this would be a very strong choice.